the Indian is the sleeper IMO. But you've done that by attributing this past few months directly to ElNino when it has been the same pattern for 40 months now. There in lies the problem. You are very quick to grab on to a small piece of a puzzle and apply it to the whole picture when it supports your cause but dismiss it out of hand when it doesn't. The fact that the rainfall pattern has been el nino like for 40 months doesn't make the rainfall pattern over the last 6 months any less el nino like. I guess when it is the same person pushing the same one sided view point it is hard for the replies to not be personal. Last year BoM were your go to when a foreign agency called a LaNina and this year they lack credibility because they won't help you over the line, yet I'm the hypocrite. Which by the way is a personal attack. BOM has always been and always will be my prime go to agency on ENSO related matters. Doesn't mean I have to agree with everything they say. In a properly coupled ElNino ,air pressure tanks in the central equatorial pacific due to the obligatory Low pressure formation. Currently there is no proper coupling . It is a patchy mess. According to the MEI page which has just updated one indicator currently in el nino range is low pressure in the central equatorial Pacific. The coupling that fuels an el nino is westerly anomalies along the western edge of the warm anomalies. This coupling is obvious throughout nearly the entire year. SSTs and atmosphere have been coupled and moving towards el nino all year. SST is just barely above el nino threshold. Atmosphere is yet to reach el nino threshold but I don't think it is a long way off. The coupling is not perfect and atmosphere is currently lagging a bit behind SST, but the coupling is there and has been there all year. The MEI index is a hybrid of SST and atmospheric conditions and the latest value is 0.46, with 0.48 considered the threshold for el nino. Values range from 0 to 1. With SSTs being only slightly above threshold the fact that MEI is close to threshold strongly suggests that overall atmospheric conditions are not too much behind threshold. Also it is worth noting that there are often very strong WWB's embedded in the MJO during LaNina events so why doesn't the pacific simply switch between ElNino and LaNina bi-annually if they are the critical driver for kelvin waves and eventual warming off South America as some seem to enforce? Because during anything resembling a building or sustained La Nina the westerly anomalies are always heavily outweighed by the easterly anomalies. I agree it is likely to get there but it is not coupled yet. The atmosphere has coupled, as evidenced by persistent westerly anomalies over the last couple of months. ...and with regard to the westerlies. As I stated before SOI is measured at only two points. Cloudiness is measured at one poin. MEI indicators are measured all across the Pacific and show significant el nino like behaviour. And four days of trade winds near normal? 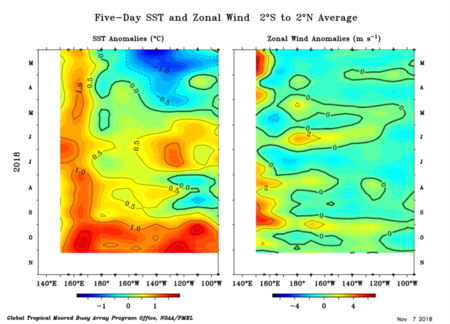 02/03, 06/07 and 09/10 all had similar periods of near normal trade winds near their peaks. So, if it’s so reliable why doesn’t the BoM use it? If their ENSO maps are good enough to use then surely their forecast is also. Atmosphere not coupled as yet, still no Nino. I can't disagree with the BoM on this occasion, the OLR values speak for themselves and the global sat pic doesn't show enough cloud over the dateline despite the positive SSTA's across the Pacific. No coupling that I can see. In fact the main focus of convection seems to be over the equatorial Indian Ocean, though that is most likely due to the MJO signal. The 200hpa patterns weakly resemble an El-Nino atmosphere with a disruption of the walker circulation above the NINO3.4 region. Fair question FSFD. What do I call average, I think you mean the state of the easterly trades across the Pacific? My own metal picture of average is the typical state of the trades as as they are circa 50% of the time when the climate is ESNO neutral. During this period, the trade strength is sufficient to pile warm water at 140 - 160E and this maintains the sub ocean flows sufficient to keep the Pacific ocean temperature profile exactly as it is now. ....Resulting in the cloud free Nino3.4 zone as we currently do have, also allowing the Humboldt current pushing up W of S America to the equatorial extent that it is currently able to attain. Like all of us posters here of late, I can see that the strength of the trades in Nino.4 (and further west above New Guinea) have been weeker than usual over the past couple of weeks. Could this push Nina indicators to warming in Nino3.4? - we all keep watching. ....or will the trades in this region resume again in a weeks time as per some models imply. ok thanks. I just not sure what your base is. I mean right now nino 1+2 is blowing around 15kmh at the 850. Would you consider that above average? FSFD - there is anomalous subsurface warmth under the central/W edge of Nino 1.2, yet surface temps remain neutral imo. At the moment. I note that SST at the W side of Nino.3 block has slightly warmed over last 3-4 days, yet waters in Nino1.2 have held steady past 4 weeks. .....so, imo, ...."near average" out that way atm. I'm a bit sceptical about 850 hPa winds being relevant to SST cooling, ....but too dumb to really comment about that. Hence a self confessed adiction to SSL wind strengths/directions. .....I reckon the clouds tell us a lot more about what impact is happening due to relative SST below (compared to locations W and/or E of any warm sea surfaces. No one is ever too dumb to make an informed comment Petros. 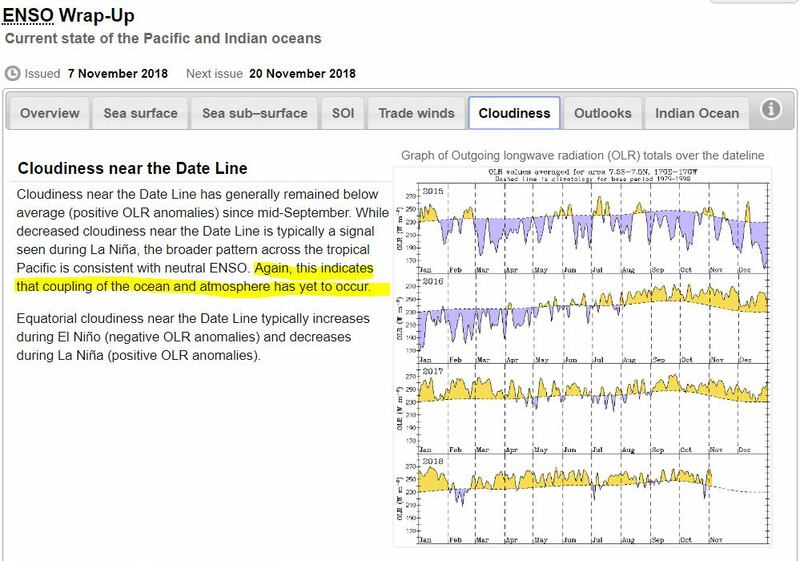 Most of the current observations and data fall far short from adequate timescales to tell us anything and "models" based upon such info are guesstimates at the very best. Argo records themselves are not only sparse but with less than 4000 floats covering more than 360 square kilometers are to say the least a drop in the ocean itself. All that aside the Models used to predict Enso events are based on anomaly's which themselves are based upon a short argo timescale along with suspect adjusted climate records. All in all any sort of predictions based upon "models" which already have a poor track record with forecasting despite their hindcast results are suspect when they try to be predictive. The best that can be said about them is that they are reactive. 2015. The western edge of the warm water is near the dateline. Westerly anomalies set up near the dateline, blowing from the cooler water towards the warmer water. 1997. The western edge of the warm water is to the east of the dateline, and there is quite a bit of westerly anomaly occurring to the east of the dateline. 2009. The western edge of the warm water is west of the dateline and much of the westerly anomaly activity is west of the dateline as well. 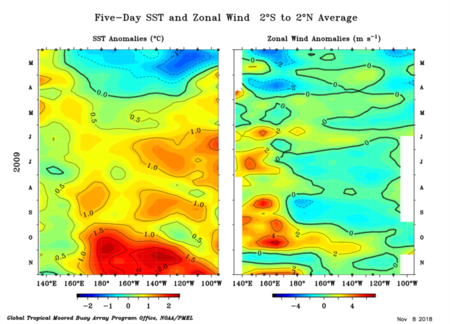 The SSTs obviously influence the atmosphere, in determining the location of the westerly anomalies. 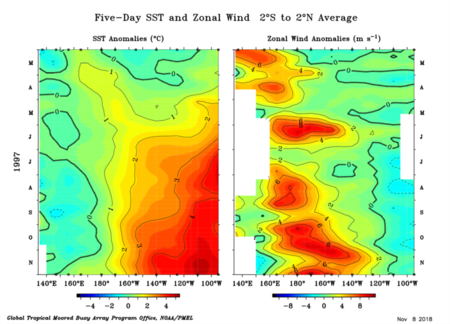 The westerly anomalies influence the SSTs by causing warming. I consider SSTs influencing atmosphere and atmosphere influencing SSTs to be coupling. And if we look at this year we see pretty much the same phenomenon. Westerly anomalies are consistently evident on the western edge of the warm water. The SSTs are clearly influencing the atmosphere, and the atmosphere is clearly influencing the SSTS, which is again what I call coupling, and has nothing to do with whether atmospheric indicators are above el nino threshold or not. We know, you’ve posted it several times now, but the evidence and the experts say you’re wrong. Move on sheesh. The multivariate ENSO index webpage is a fascinating read and thanks for the link. I can't presently access from home computer but did copy files from the site earlier today and the last entry in the index data I have is .468 Sept-Oct. Is 0.460 the figure for Oct-Nov? Got any theory on how all this is happening Steve ? (Bolded part) It's got to be one or the other to have any real effect/cause really. 360 square kilometers should read 360 Million square . Warm water increases tropical convection, causing lower pressures, resulting in westerly wind anomalies. 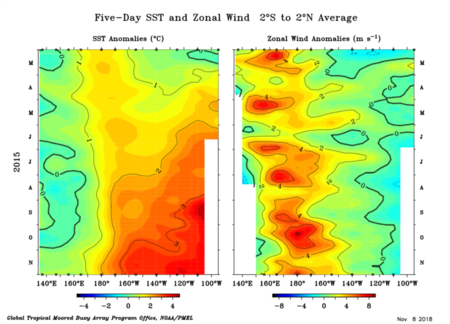 Westerly wind anomalies reduce the flow of cool water from below and from the east. And if it is only westerly anomalies and not actual westerly winds then there is the added impact of reduced wind speed resulting in less evaporative cooling. Statistical models will tend to be based on anomalies. But dynamic models must be based on actuals or they will not work at all. The CHI 200 which is one of the leading indicies to determine the broader vertical circulations critical to ENSO is nowhere near coupled yet and has for the most part been more in the La Nina window of late than the El Nino with broader uplift and negative values over the Indian and Indonesian regions and downlift and positive values over the Americas. There are hints of a weakening on the models by the end of the month which will be interesting to see how that pans out but for now it aint there yet. The atmosphere is still front running the oceans for now. IOD wise it's been most interesting! Broadly speaking we have seen a longer period of negative values than positive values through the typical IOD season. The persistent cooler anomalies have really had nothing to do with a typical IOD pattern but more so a classical Ningaloo Nina where persistent cooler/colder water upwells and pushes N/NNW off WA and into the measuring window for the eastern IOD. Most of the time the cooler water has been below and SE of this and hence the negative IOD values for much of the autumn and winter...however in spring, vigourous and rapid warming off Africa caused a huge spike to well above positive thresholds and thus the index jumped. Interestingly, as soon as it rose, it fell again but not before averaged values were enough for BoM to call a positve IOD. However when falling the moisture suddenly started to come down more freely from the NW across Australia but not before a very dry September co-inciding with the big positive spike. September destroyed a lot of crops, including many which were going well, were rendered down to the average or below average category and the ones doing barely ok were reduced to hay at best. A lot of the August moisture was fed down west of Australia into the peaking and persistent LWT near Perth (see record swells in Indonesia for that) and thus with the well timed negative SAM gave good rains to southern and sw aus so we still got out Indian moisture but this was short lived. After that things changed very quickly and killed the season. So quite a unique year in the fact we had more negative IOD values but the positive spike came at the critical moment but atmospherically, the behaviour has not been classical of either positive or negative IOD and generally much more neutral. 2006 is a year that comes to mind for more typical behaviour. Ningaloo Nina is the number 1 culprit in my eyes for our dryness (among other factors) but unfortunately seldom gets talked about, certainly not in the public eye. Back to ENSO, we still remain neutral, the atmosphere continues to lower pressures near Darwin now with thunderstorms becoming more consistent. This cold air surge pushing N from the large upper trough over the past couple of days will perhaps cause a brief delay but as long as the trades keep blowing will make things difficult for a proper El Nino....have maintained a more modoki like setup is the most likely outcome or generally neutral....if the MJO gets anywhere past phase 5 then things will take a turn but it doesn't want to go there yet with trades keeping up and will keep up as pressures lower over Darwin making it that bit harder with every passing day. But watch the CHI200, that is the key. Classical and historical signatures are available on the web for all to see and the picture is clear for those..
A new westerly wind burst has formed and is forecast to continue throughout the short term forecast period. Latest TAO shows that despite a few days of above average trades recently in the west, this was not enough to show up once the 5 day average and smoothing algorithm is applied. This is despite the fact that the MJO is currently at moderate strength and moving through the La Nina favourable Indian Ocean phases. The influence of the warm water on the atmosphere is now substantial enough that it can counteract the influence of a moderate strength MJO on trade winds. Sorry, but I can’t see any WWB on that MSLP. 9 registered (Sidney, betsuin, Snowmaker, Lee@Hazo, Locke, mysteriousbrad, Multiversity, Homer, 1 invisible), 65 Guests and 3 Spiders online. Generated in 0.075 seconds in which 0.050 seconds were spent on a total of 14 queries. Zlib compression disabled.